New Delhi: When Maya Chadda was still Maya Kulkarni, an unmarried graduate student in New York City, she received a telephone call that was unusual but in no way indicative of the extraordinary events to come. 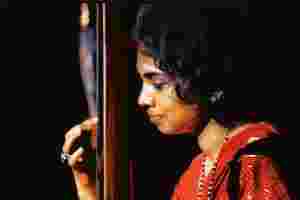 Ravi Shankar, on tour in the US, was suddenly missing his tanpura player, who had fallen ill, so could she step in for a few concerts? Chadda could, fortunately—which is how, 40 years ago, she found herself on stage, in front of hundreds of thousands of people, at the century’s definitive rock-and-roll event: Woodstock. “That’s right: Woodstock!" Chadda tells her students at William Patterson University today. Usually, there is then a spell of silence, as they wrestle with the image of their political science professor at a three-day, marijuana-clouded conclave of hippies. “Their jaws fall open. They cannot believe it," Chadda says. “But it’s a bit of a teaching strategy. It’s what I use to get them to interact with me as an individual, not as a professor." Fortunately for Chadda’s pedagogy, she had known Shankar from her girlhood in Bombay, when she used to visit the Bhulabhai Desai Institute to learn Bharatanatyam. “M.F. Husain and Vasudeo Gaitonde used to have studios there, and Raviji had classes and rehearsals and stuff," Chadda remembers. “Then I came away to the United States to study, and Raviji was performing all over the place here. So even though I wasn’t part of his team, I had been a part of the dance and music world, and he had known me." Chadda, a very sheltered 22 at the time, was uncertain at first if she should volunteer, if she would be able to sit with the requisite straight-backed elegance for two hours. Shankar offered a simple suggestion: Practise first. “So I did that," Chadda says. “I was part of five or six performances, all on the east coast of the United States. I had very little knowledge of the popular music scene at the time, and even less knowledge that I was going to participate in something so historic." As the Shankar entourage drove towards Woodstock, Chadda was struck by the road’s gradual transformation into “something like a parking lot". Thousands of people were converging on the town, many by foot, and Shankar’s car was soon mired in this swamp of humanity. “Somehow, Raviji’s agent got in touch with the organizers," she says. “So out of nowhere, this helicopter came, lifted us off the highway, and took us to our hotel." The Woodstock Music & Art Fair, as it was officially titled, was originally intended to be a ticketed event for 200,000 attendees. It turned free in a hurry when more than half a million people flooded the grounds of the dairy farm owned by the benevolent Max Yasgur. Beginning 15 August, over three intermittently rainy days, these many thousands packed into a muddy field to listen to 32 concerts—including Shankar’s, on the festival’s opening day. The morning of that day, a Friday, Shankar, Chadda and tabla maestro Allah Rakha huddled with other musicians in a shed, waiting for their helicopter. “There were chickens there, and this guy was chasing the chickens. Then in the helicopter, he sat in front of me and started pulling hair out of his chest," Chadda says. “I asked Raviji what was going on, and he said: ‘Pagal aadmi hai. Maja dekho.’ (He’s crazy. Just watch the fun)." She would later discover that the crazy man was Jimi Hendrix. Backstage, the artists waited in a big, sweltering tent for their turn to go on stage; there was no water, and the festival was already behind schedule when Swami Satchidananda, a religious teacher, declared it open in the late afternoon. With little to do, Chadda wandered about the tent, not knowing a single musician, just content to stare at what she calls “the highest rank of bizarre I’d ever seen, in how they were dressed, the colours, the hair, the tattoos, everything". “It was very loud, and Raviji couldn’t really tune up because of the noise," she says. “There was Janis Joplin backstage, and Joan Baez, who was just beautiful, with a serene face, singing really passionate songs about oppression. I could appreciate that—the words were clear, not like all the other singing that seemed so frenzied to me." It was 10pm, with rain in the night air, when Shankar’s troupe finally took the stage, to begin a five-piece set with the raga Purya Dhanashri. “I remember people looking a little confused but also knowing who he was and what he did," says Tommy Maher, who was in the audience at Woodstock, and who is still so stricken with its spirit that he signs off his messages with a “Peace Always". “I do remember the girl in the group, and I remember a lot of smiling from the whole group." Shankar and Allah Rakha played for an hour, virtually non-stop; one photograph from Woodstock, shot from the back of the stage, shows them bent over their instruments, outlined in light, as rain falls into their audience. “They were all listening in rapt attention, although I’m not sure if it was induced by marijuana or by the music," Chadda says. “But it was received with a standing ovation—well, an ovation, since they were all standing anyway. Raviji that day was like God. Absolutely like God." Shankar himself, however, was not enthused with Woodstock. Two years earlier, performing at the Monterey International Pop Music Festival, he had admired some musicians but been aghast at many others. “[W]hen he saw the Who destroy their instruments, followed by Jimi Hendrix burning his guitar…Shankar felt physically ill," wrote Peter Lavezzoli in Bhairavi: The Dawn of Indian Music in the West. “Shankar was especially disappointed with Hendrix, whom he considered a brilliant guitarist, making the destructive act all the more wasteful." In his autobiography, Raga Mala, Shankar would later write: “If Monterey was the beginning of a new movement or beautiful happening, I think Woodstock was almost the end." When he spoke to interviewer Karan Thapar a few decades afterwards, Shankar’s murmured recollections were telling: “So much trash, so much violence." Shankar’s visceral reaction was evident to Chadda even in 1969. “It would upset him. For him the music was intoxicating enough, and he didn’t like the fact that people heard the music stoned," she says. “He really thought they didn’t quite understand the power of the music, and its potential, and that bothered a serious musician like him." Shankar was always acutely conscious of the worshipful nature of his music. “Even at Woodstock, he got up at 4am, did his puja for 90minutes, and then did his practice," Chadda says. “Only after that would he come out for breakfast." For Chadda, though, the excitement was contagious. “The distinctions between artist and audience collapsed—not physically, but there was an incredible thread stretching between us," she notes. “It’s a spontaneity that I have never encountered since then." It was only after a few years that Chadda truly realised the magnitude of Woodstock. She had proceeded to complete her Ph.D., balanced for a few years her twin loves of dance and academia, and landed finally on the side of academia. Chadda continues to dance, however, and has been favourably reviewed by the New York Times, among other publications. But her accidental connection to Woodstock has remained strong; she learned recently that somebody “wanted to fly out from the midwest (of the US) just to get my signature on some memorabilia. Can you imagine!" Chadda has returned only once to Woodstock. In the mid-1970s, on her way to a dance performance in the town of Poughkeepsie, she took a small detour and stopped off at the farm. By then, Yasgur had sold the land and, in 1971, died of a heart attack. “It’s just a field now, of course," Chadda says. “But immediately, the memories came flooding back."